How Many Times are you Prepared to Fail? I’m reading a book called Mindset by Prof Carol Dweck. She has a lovely TED talk on the subject. She speaks of two mindsets: a fixed mindset or a growth mindset where you believe that people can improve on their abilities, intelligence, talents etc. People of the growth mindset are far more inclined to try harder to learn, and aren’t as afraid to fail, relative to those with a fixed mindset. 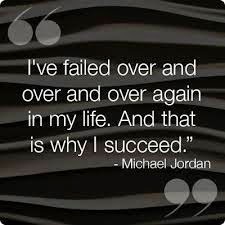 I’m always interested in what keeps people going after failures and why they persevere. I’ve read many entrepreneurial articles that encourage the reader to keep trying despite spectacular failures. They cite numerous examples of really famous and successful entrepreneurs who have failed many times before succeeding. Many authors have also written a number of books that failed to achieve anything before they really ‘made it big’. Having managed a small business and failed to turn it around, I sometimes wonder what else I could have done or what I should have done differently. Truth be told, I should have been wiser at the outset but at least I am now. I spent almost five years in the business, struggling to bring my strategy to life and to take all elements from the 1980’s into the present: software, processes and mindsets. What a struggle that was and it still didn’t result in a profitable business. Yes I learned a lot but I also failed at many things. I’m not too fond of failure. I did well at school and I like to succeed. I’m not afraid of hard work but I do find the failures tough. Yes, I know what you’re thinking: ‘There’s no such thing as a failure, there are only lessons’. That may be so, but it doesn’t make the ‘lessons’ any less difficult to live through. It is daunting starting something new, knowing that it might not work. The next job I take on, or the next project I start might not be successful. My book might be an utter disaster, only purchased by my friends. But what are my options? I can’t give up. I can’t hide in a corporate cubicle as I will surely perish. I simply have to give it a try. And I may well fail many times over. My main focus will be that I’m doing what I love and that I manage my failures wisely and take the lessons without feeling defeated. I want to follow my passion and make sure each day has something enjoyable in it. I want to have time for my children and time for myself to reflect and to grow myself. I want to ensure my week includes something creative and something just for me. If I imagine a life like this, it may not bring in a lot of money but I will be happy and that will be worth it. Thinking of the opposite where I bring in a lot of money but I’m tied to other people’s dreams, deliverables or passions, is simply not an option for me. I live my life for me now. I invest my time and energy in those closest to me and in things that will bear fruit. If I don’t get EROI (Energy Return on Investment) from someone or something, it won’t feature. If I think about the amount of work that goes into writing a book, and the risk that it might be a failure, it can be quite discouraging. But it’s probably only through the practice of writing a lot, that I’ll improve enough to succeed. Hard work and perseverance in activities that induce flow and energise me, will be key ingredients to a successful and happy life in future. Failing along the way is just part of the journey I guess.